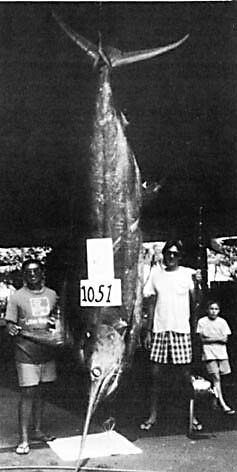 This was the fourth largest black marlin caught in Kona until this time. The fish won the 1993 Kona Iki Trollers Invitational Tournament for Capt. Mike Oshiro and the KRISTA-O, a 17-foot Alii Kai boat. Interestingly, as they towed the fish to the harbor, two different marlin were attracted to the fish alongside their boat.